Child Sexual Abuse (CSA) is defined as the sexual touching or penetration of children. The definition generally includes attempts as well as completed assaults. There are other forms of illegal or unwanted sexual experiences such as exposure, peeping, or sexual harassment in the form of talking in a sexually inappropriate or intimidating way. showing a child images of sexual activity, including photographs, videos or via webcams. 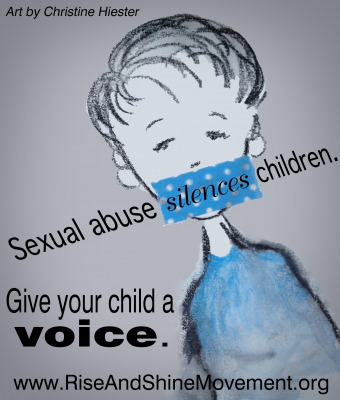 What if your child discloses sexual abuse to you? One of my adult children told me the reason he could talk to his father and me about difficult situations was because we didn't "overreact." I remember some of his "difficult situations." I'm glad he remembers we responded calmly. Believe me, inside I was anything but calm. This is vital in instances of sexual abuse disclosures. Our children must feel safe with us or they may shut down. We may not have all the answers, but there are people and organizations that will help us find them. When we communicate to our children that we love them, will listen to them, and will believe them, we build a sturdy bridge of communication that our children can walk across. We, as parents, want to be the "go-to persons." We won't be if we overreact. This will not be easy — 90% of violated children were violated by someone they know, trust, and often love. If your child discloses abuse, chances are you will know, trust, and perhaps, love the violator, too. Resist the temptation to deny the unthinkable. Believing can open the door to help and restoration. Should your child disclose abuse to you, do not ask leading questions such as, "Was it Uncle Jack? Did he touch your chest?" Instead ask, "What happened next? And then what happened?" You want to get as much information as you can without making rash judgments or decisions. Although you may feel paralyzed and devastated, please call one of the hotlines listed on our resource page or your local child protection agency. Trained counselors will help you discern whether abuse has taken place and will gently guide you toward your next step. Sexual abuse is a crime in all fifty states. If abuse has occurred, it must be reported. Perpetrators need help. Children deserve protection.